I had never seen such a carrier before...it stacks! 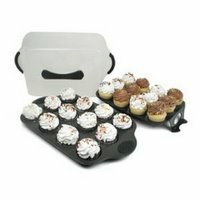 Far superior to the round cake carrier I have (cupcakes can jostle) or using the disposable trays from Safeway (flimsy, difficult to wash, yet wasteful to throw away). Anyway, I've been thinking about pie more than cupcakes lately. Last night I started on pie crust for butter pecan pie, which I plan to make with a mixture of maple syrup and honey instead of corn syrup. Also on the to-do list are pumpkin-orange marscapone pie, roasted Brussels sprouts, and Dan is making sweet potato biscuits.